We purchased and completely renovated this home in 2013. It's 4 miles (6.5 KM) from the airport, 2 blocks to Divoka Sarka park and 20 minutes into Old Town. The bus or tram stop is only 1 block away, a short ride takes you to Nádraží Veleslavín Metro station (Line A-Green)and on into historic Prague. This one bedroom apartment in a family friendly neighborhood and building has a fully equipped kitchen, one bathroom with tub/shower and separate toilet area, living/dining room w 2 beds and washer & dryer, towels and linens provided. Sleeps 5 Secure 3rd floor walk-up with garden space behind the building. 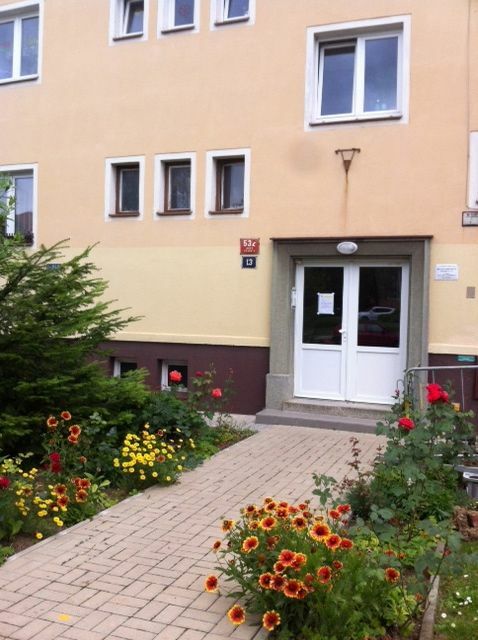 Our Prague home is located approximately 10 kilometers from the city center. I'll be happy to supply you with detailed suggestions and instructions on using the transit system. Bila grocery store is about a 10 minute walk away (flat is supplied with rolling cart for shopping). Several excellent restaurants are within walking distance too. Our son, daughter-in-law and two grandsons live in the neighborhood. We place high priority on staying close to family and visit frequently from our home in Texas. Near our kids in a nice family neighborhood. We purchased and renovated this home to stay in when we visit. Stay where the locals live and get a real flavor of modern Prague outside the tourist areas. You can get to all the sights within half an hour easily with public transit and rest and recoup in a less hectic area in the evening. The airport is only minutes away and can be reached by bus or taxi, no need for a car. Grocery shopping, bars and restaurants are within walking distance. Tub/shower, towels, hair dryer and custom vanity; separate toilet room. This renovated flat in Prague 6 has refinished wood and tile floors, new windows throughout, and is located in a quiet family building and neighborhood. We purchased and renovated in 2013 with all new bathroom and kitchen fixtures. This is a good place to relax after a busy day seeing the sights of historic Prague. This is a great apartment in a really good location, close to the airport and 25 minutes to Old Town Prague by public transport. The Coles were extremely helpful in providing information prior to our stay. Great spot! Nice apartment in a quiet neighborhood but very convenient to the downtown area. Very clear instructions and good information about necessaries such as ATMs. Thank you! Clean, quiet, family-size apparment convenient to Prague but without the crowds. We stayed here with our three kids, and had enough room to be comfortable. The full-sized washer and full-sized dryer were a huge benefit when traveling on a long trip. We had an issue with the wi-fi at first, but the owner was responsive and took care of it. I would stay here again. This spotless, roomy, comfortable apartment provided everything we needed for our stay in the Czech Republic, including a beautiful park basically across the street that made us feel like we were far away from the congestion of Prague. The info packet we received had tons of helpful info to help us get acclimated to the area and help us figure out how to get around, shop for groceries, eat out, etc.. The apartment is so close to the public transit that we were able to park our car for the trip and not worry about where we could park in Prague. We loved the quiet feel of the neighborhood away from the hustle and bustle of Prague - we felt like we were really experiencing a bit of what it is like to live there. Would definitely stay there again! Loved Janice's Prague House! Although the flat was a ways from downtown it was easy access by bus, tram and train. The location was quiet. Loved the decor and set-up of the flat. The bath towels were great. And I have to say that I love European toilet paper! Weird I know. We stayed at this very clean and roomy apartment at the mid-point of our trip, and we were quite pleased with all of the little extras that were provided. Having a washing machine and dryer were a big help as it was time to "freshen up" our wardrobes. The apartment is in a great spot to easily reach public trams and buses. There are several restaurants and a grocery store nearby. And for those quick meals and snacks there is even a McDonald's close by. One thing that we especially appreciated was that the owner had prepared a notebook detailing helpful info regarding public transportation, restaurant locations, and general info about Prague and the surrounding area. Of particular help to us were the written out instructions for using the appliances, especially the washer and dryer. These appliances operated a little differently than what we were used to, so having instructions was a relief! (During our trip we stayed in other privately owned rentals in which no such instructions were provided, and consequently we opted not to use specific appliances for fear of operating them wrong). Another thing we noticed when comparing this apartment to some of the others we stayed at was the plentiful amount of towels and paper goods that were provided (which was not always the case in other places). In summary, this was a very comfortable and convenient apartment, large enough to accommodate a family or two couples traveling together. A very good value which we highly recommend to others. Family neighborhood; walking distance to grocery shopping, restaurants and bars; 2 blocks to large Divoka Sarka park; 1 block to bus and tram stops. Guests are required to read and agree to Rental Agreement and Rules prior to booking.